How are color preferences formed, and can they be changed by affective experiences with correspondingly colored objects? We examined these questions by testing whether affectively polarized experiences with images of colored objects would cause changes in color preferences. Such changes are implied by the ecological valence theory (EVT), which posits that color preferences are determined by people’s average affective responses to correspondingly colored objects (Palmer & Schloss, Proceedings of the National Academy of Sciences, 107, 8877–8882, 2010). Seeing images of strongly liked (and disliked) red and green objects, therefore, should lead to increased (and decreased) preferences for correspondingly colored red and green color patches. Experiment 1 showed that this crossover interaction did occur, but only if participants were required to evaluate their preferences for the colored objects when they saw them. Experiment 2 showed that these overall changes decreased substantially over a 24-h delay, but the degree to which the effect lasted for individuals covaried with the magnitude of the effects immediately after object exposure. Experiment 3 demonstrated a similar, but weaker, effect of affectively biased changes in color preferences when participants did not see, but only imagined, the colored objects. The overall pattern of results indicated that color preferences are not fixed, but rather are shaped by affective experiences with colored objects. Possible explanations for the observed changes in color preferences were considered in terms of associative learning through evaluative conditioning and/or priming of prior knowledge in memory. What determines aesthetic preferences for colors? Recent theories have suggested several possibilities: The cone-contrast theory posits that color preferences arise from hard-wiring in early visual processing (Hurlbert & Ling, 2007; Ling, Hurlbert, & Robinson, 2006); the color-emotion theory suggests that they arise from the emotional content of colors (Ou, Luo, Woodcock, & Wright, 2004); and the ecological valence theory (EVT) hypothesizes that they result from people’s combined liking/disliking reactions (valences) to all correspondingly colored ecological objects (Palmer & Schloss, 2010). Consistent with the EVT, 80 % of the variance in adult Americans’ average preferences for 32 chromatic colors could be predicted from the weighted affective valence estimates (WAVEs) for those colors (Palmer & Schloss, 2010). The WAVE of a color was defined as the average of the liking/disliking ratings of all things associated with that color, weighted by the similarity between the color of the object and the color patch with which it was associated. The color preferences of British (Taylor & Franklin, 2012) and Japanese (Yokosawa, Schloss, Asano, & Palmer, 2013) participants have also shown strong positive correlations with preferences for correspondingly colored objects.1 With only correlational evidence, however, the direction of causality is unclear. Do affective experiences with colored objects drive color preferences, as the EVT proposes; do color preferences determine people’s affect related to objects; or both? Clearly, colors can influence object preferences, as when someone purchases one T-shirt among many that differ only in color. The primary focus of this article, however, is whether experiences with colored objects causally influence color preferences, as the EVT predicts. Indirect evidence has shown that people’s preferences for specific color-associated entities can change their general color preferences. Schloss, Poggesi, and Palmer (2011) compared students’ color preferences at two rival universities with strong color associations: the University of California, Berkeley (blue/gold), and Stanford University (red/white). As the EVT predicts, students at both universities liked their own school’s colors better than their rivals did, and the degree to which they did so was correlated with their self-reported amount of “school spirit” (positive affect) for their university. This pattern supports the idea that preferences for color-associated things influence preferences for the associated color, because it is highly implausible that students choose their university and develop their level of school spirit on the basis of how much they like that university’s colors and dislike its rival’s. The experiments described below directly tested the hypothesis that color preferences change as an individual processes positive/negative experiences with correspondingly colored objects. Each experiment included three phases. First, participants rated their preferences for a set of colors. Second, as part of “a separate study,” they either saw or imagined 40 colored objects while performing various tasks. One group saw/imagined positive red objects (e.g., strawberries and cherries) and negative green objects (e.g., mold and pond scum), whereas the other group saw/imagined positive green objects (e.g., ripe kiwi fruit and healthy trees) and negative red objects (e.g., open wounds and sores). Finally, participants rated their preferences for the same colors again. We assessed reliable increases/decreases in color preference due to this experience with positive/negative objects. We attempted to alter color preferences by showing participants affectively biased images of 40 colored objects in a three-phase experiment. After rating their preferences for 37 colors (to provide a baseline), participants were randomly assigned to one of two groups. The G+/R– group saw ten images of positive green objects (e.g., ripe kiwi, spring foliage), ten images of negative red objects (e.g., open wounds, an infected eye), and 20 images of relatively neutral objects of other colors (e.g., a screwdriver, a ladder). The R+/G– group saw ten images of positive red objects (e.g., raspberries, roses), ten images of negative green objects (e.g., pond scum, moldy food), and the same 20 images of other-colored neutral objects. Finally, all participants rated their color preferences again to measure changes caused by viewing the colored objects. The participants were told that the first and third parts were research on color aesthetics, whereas the second part (as well as a previous initial study) was research on spatial aesthetics. Different experimenters ran the color and spatial studies in order to reinforce their separation. In Experiment 1A, participants saw each image of each colored object in four “spatial” tasks: verbal-label fit, center localization, complexity judgment, and object preference rating. In Experiment 1B, they completed the first three “spatial” tasks but did not rate object preferences. By comparing the results, we could determine whether affective judgments were necessary to elicit changes in preference. Results are reported for 46 participants (28 female, 18 male) in Experiment 1A and 46 other participants (34 female, 12 male) in Experiment 1B, divided into two equal groups for the image-exposure phase. Participants in all three experiments had normal color vision (measured with Dvorine Pseudo-Isochromatic Plates) and gave informed consent. The UC Berkeley Committee for the Protection of Human Subjects approved the protocol. To make the experiment seem like an assortment of different experiments, participants first completed a short, unrelated spatial aesthetics task. They then completed the following three phases of the present experiment. The colors consisted of eight hues (red/orange/yellow/chartreuse/green/cyan/blue/purple) at four different saturation/lightness levels (saturated/light/muted/dark), plus five achromatic colors (white/light gray/medium gray/dark gray/black) (see Table 2 in the Appendix for the CIE 1931 xyY and Munsell coordinates). The colors were presented on a gray background (CIE x = 0.312, y = 0.318, Y = 19.26) and were viewed from a distance of approximately 60 cm. The iMac computer monitor (1,680 × 1,050 pixels, 39.58º × 25.36º) was calibrated using a Minolta CS100 Chroma Meter. Colored squares (100 × 100 pixels, 2.5º × 2.5º) were presented singly in a random order, centered on the monitor. Participants indicated how much they liked each color on a line-mark response scale by sliding the cursor to the appropriate position and clicking the mouse. The 400-pixel response scale at the bottom of the screen was labeled not at all, at the left end, and very much, at the right end, with a tick mark at the center indicating neutrality. Responses were rescaled from −100 to +100. Participants first completed an “anchoring task” (Palmer & Schloss, 2010) to scale their preferences in the present context. They viewed all 37 colors simultaneously and were asked to point to the colors that they liked most/least. They were instructed to rate the color that they liked most as very much and the color that they liked least as not at all. Participants then rated all colors once in each of two blocks. Each color was presented until a response was made, and the next trial began 500 ms later. We calculated the correlation between their ratings for corresponding colors in Blocks 1 and 2. If this correlation was less than + .70, their performance on the color preference task was considered insufficiently reliable. Thirteen of the participants from Experiment 1A and 19 from Experiment 1B were thereby excluded and provided no data on the tasks described below, but they still received full credit for participating. The cutoff value of + .70 was chosen (somewhat arbitrarily) to ensure that participants had baseline preferences that were sufficiently stable to make detection of posttreatment changes likely. Only including participants with stable preferences helped ensure that the observed changes in preference in the experiment would be due to the experimental treatment. Participants completed several “spatial tasks” so as to experience the colored objects. These tasks, along with the initial spatial aesthetics task (see above), were administered by a second experimenter in order to reinforce the cover story that they were unrelated to the color preference task. All participants in both Experiments 1A and 1B completed the following judgments: verbal-label fit, center localization, and complexity. Only the Experiment 1A participants also completed the final object preference task. In each task, participants saw 40 images of objects in a random order: 10 green, 10 red, and 20 objects of other colors (see Fig. 4 in the Appendix). Only the red and green objects were specific to the object exposure group (R+/G– or G+/R–). In the verbal-label fit task, images were presented with a label describing the content of each image. Participants were asked to categorize each image as either “well labeled” or “poorly labeled,” using the right and left arrow keys (respectively). This task was designed to inform participants indirectly of what object(s) were depicted in the images. The labels were always reasonably good for the critical red and green objects (e.g., “strawberries” for strawberries and “pond scum” for pond scum). They were sometimes nonspecific for the other colored objects (e.g., “tool” for a screwdriver), but were never misleading. In the center localization task, participants were asked to move the cursor to the center of the focal object(s) and to click the mouse. In the complexity judgment task, participants were asked to rate each image’s complexity on a line-mark scale from very simple (left endpoint) to very complex (right endpoint). Participants in Experiment 1A then completed the object preference task, in which they saw each image and were asked to rate how much they liked the object(s), on a line-mark scale from very little (left endpoint) to very much (right endpoint). This task was excluded from Experiment 1B in order to determine its influence on preference changes for the corresponding colors. Phase 3 was the same as Phase 1, except that participants were told that some colors were different. Two additional colors (bright orange and lavender) were added. After the experiment was completed, participants were asked to guess its purpose. If they mentioned changing color preferences by exposing them to positive/negative colored objects, their data were excluded from the analyses. Two participants did so in Experiment 1A and five in Experiment 1B, none whose data are included in the results reported below. An initial pilot study was conducted to determine which colors to examine for changes in preference after image exposure. Five other participants were shown each of the 40 object images (Fig. 4) and asked to pick the color most similar to the dominant color in the image from among the 37 colors. Saturated red (SR) and dark red (DR) (henceforth referred to as “reds”) were most frequently selected for the red images, and saturated chartreuse (SH) and dark chartreuse (DH) (henceforth referred to as “greens”) were selected for the green images. We measured how participants’ color preferences changed after image exposure by subtracting their average preferences for reds and greens in Phase 1 from their average preferences in Phase 3. The average changes in preference for the other 33 colors were considered controls. The results (Fig. 1) show a three-way interaction between change in preference (red/green), image exposure group (R+/G– vs. G+/R–), and inclusion of the object preference task (Exp. 1A or 1B) [F(1, 88) = 5.13, p < .05, η 2 = .06]. The participants who completed the object preference task (Exp. 1A) showed a significant interaction2 between image exposure group (R+/G– vs. G+/R–) and preference change (red/green) [F(1, 44) = 7.81, p < .01, η 2 = .15] (Fig. 1a): Those in the R+/G– group showed an increase in preference for red over green [F(1, 22) = 3.25, p < .05, η 2 = .13], and those in the G+/R– group showed an increase in preference for green over red [F(1, 22) = 7.17, p < .01, η 2 = .25]. Tests against zero (no change) and against the average of all other colors indicated that preferences for the colors of positive objects reliably increased [R+/G–, Fs(1, 22) = 2.97 and 3.48, ps < .05, η 2s = .12 and .14, respectively; G+/R–, Fs(1, 22) = 6.07 and 4.71, ps < .05, η 2s = .22 and .18]. The predicted negative trends in preferences for the colors of negative objects were present, but not statistically reliable (Fs < 1). Although the cause of this asymmetry is unclear, it was not due to a floor effect in red/green preferences preventing decreases. In the initial color preference task, the mean preference was greater for the reds than for the greens (reds = 24.8, greens = −22.9; t(54) = 6.32, p < .001, two-tailed), but both were much more preferred than the least-liked colors (e.g., dark yellow = −52.87, dark orange = −63.94). Participants may have attended less to the unpleasant images in the experiment in order to minimize negative emotions, but such an interpretation will require further study. The EVT also predicts that the degree to which an individual’s color preferences will increase/decrease due to object exposure will depend on how strongly he or she likes or dislikes the objects. We therefore correlated the differences between individuals’ preference ratings in Experiment 1A for the red/green objects (Ro–Go) with the differences between their change in preferences for the relevant red/green colors (ΔRc–ΔGc). This reliable correlation (r = +.41, p < .01) further supports the EVT, which predicts that the more strongly that people prefer the liked red objects (R+) to the disliked green objects (G–), the more their preference for red should increase relative to green, and vice versa. Participants who did not rate object preferences (Exp. 1B; see Fig. 1b) did not show the Color × Image Exposure Group interaction (F < 1) of Experiment 1A. Perhaps when not explicitly evaluating the objects, participants were not affectively engaged with the stimuli, in which case the EVT would imply no change in preference for the color of the object. Another possibility is that the absence of the preference task simply reduced the number of exposures. It seems unlikely, however, that one additional viewing of each image would have such a dramatic effect, especially given that a similar crossover interaction arose in Experiment 3 when objects were imagined only twice. In Experiment 1B, participants did show an unexpected main effect in preference change for red versus green [F(1, 44) = 5.32, p < .05, two-tailed, η 2 = .11], but this effect was not reliable within either of the object exposure groups alone [R+/G–, F(1, 22) = 2.57, p = .11, η 2 = .11; G+/R–, F(1, 22) = 2.80, p = .11, η 2 = .11, two-tailed]. Given that red was initially more preferred than green, the main effect of color may have been due to mere exposure effects, where additional exposures to an affectively polarized stimulus further polarized attitudes toward it (Brickman, Redfield, Harrison, & Crandall, 1972). The main effect of group in Fig. 1b was not significant [F(1, 44) = 1.91, p > .05, η 2 = .04]. In Experiment 1, people’s preferences for specific colors changed after experiencing and rating preference for affectively biased images of correspondingly colored objects, when there was minimal delay between the end of the image exposure phase and the start of the postexposure color preference task. Here we measured the temporal duration of this change in color preference by testing both immediately and 24 h later. Results are reported from 67 participants (48 female, 19 male), with 34 in the R+/G– and 33 in the G+/R– group. An additional 17 participants who were tested in the initial color preference task did not complete the experiment because their Block 1–Block 2 correlation in the initial color preference task was less than .7. The data from two additional participants were excluded because they correctly discerned the purpose of the manipulation. All methods were identical to those in Experiment 1A, with the addition of a second postexposure color preference task approximately 24 h after the initial one. The immediate retest replicated the interaction in Experiment 1A between preference change and object exposure group [F(1, 65) = 5.18, p < .05, η 2 = .07]. We replicated the within-group differences between changes in red and green preferences in the R+/G– group [F(1, 33) = 3.75, p < .05, η 2 = .10], but the corresponding difference in the G+/R– group was only marginally reliable [F(1, 32) = 1.67 p = .10, η 2 = .05] (see Fig. 2a). After a 24-h delay, however, we found no corresponding interaction (F < 1) or within-group differences (F < 1 for both groups), indicating that the overall effect of image exposures is short-lived (Fig. 2b). However, an analysis of individual differences showed that the degree to which individuals changed their preferences on the immediate test was predictive of the degree to which the effect was evident at the longer delay (Table 1), suggesting that stronger effects of object exposure are more likely to last longer. Females showed this pattern more reliably than males did, but it is possible that this effect was influenced by differences in the sample sizes (48 females, 19 males). In Experiments 1 and 2, people’s color preferences changed systematically in the direction predicted by the EVT after viewing an affectively biased series of photographs of colored objects. In Experiment 3, we studied whether similar changes could be induced by people imagining similarly biased sets of colored objects. The theoretical question was whether stimulus-driven sensory color experiences are necessary for affect about the colored objects to change color preferences, or whether merely activating preexisting affective knowledge of perceptual properties is sufficient. Results are reported from 56 participants (42 female, 14 male), with 28 in each object exposure group. Seventeen participants did not complete the experiment because their Block 1–Block 2 correlation in the initial color preference task was less than .7. The data from six additional participants were excluded from the analyses because they discerned the purpose of the manipulation. The design, displays, and procedures were the same as in Experiment 1A, except that in Phase 2 participants completed the mental imagery tasks described below. Participants completed three mental imagery tasks: color matching, imagery strength, and object preference. In the color-matching task, participants were presented with group-specific object descriptions (see Table 3 in the Appendix) displayed as black text on the gray background of the monitor. They had 2 s to form a mental image of the object, after which the array of 37 colors appeared. Their task was to click on the color that best matched the color in their mental image, using the mouse. This task required participants to attend to the characteristic color of the described objects. The imagery strength and object preference tasks were then administered as one experiment. Participants imagined each object for 2 s, then rated the strength of their mental image on a line-mark scale from very vague to very vivid, as well as how much they liked the object in their mental image on a scale from not at all to very much. As in Experiments 1A and 2, we found a reliable interaction between color and object exposure group [F(1, 54) = 7.66 p < .01, η 2 = .12]: R+/G– participants showed a significant increase in preference for red over green [F(1, 27) = 5.64, p < .05, η 2 = .17], and G+/R– participants showed an analogous trend that was nearly significant [F(1, 27) = 2.11, p = .08, η 2 = .07; Fig. 3]. These results are comparable to those from Experiment 1A, as indicated by the lack of an Experiment × Color × Exposure Group interaction (F < 1) and the similar Color × Exposure Group interaction effect sizes (Exp. 1A, η 2 = .15; Exp. 3, η 2 = .12). These findings suggest that strongly color-associated mental images, memories, feelings, and concepts can influence preferences for colors, much as sensory experiences of depicted objects do. Such changes would not occur unless people had previous knowledge of the objects’ colors, so the most relevant factor is likely the temporally contiguous activation of affective responses and color associations to the same objects. This was the case in Experiments 1A, 2, and 3, but not in Experiment 1B, in which affective information may not have been activated without the explicit affective rating task. The present results support the EVT’s proposal that color preferences are determined, at least in part, by object preferences. 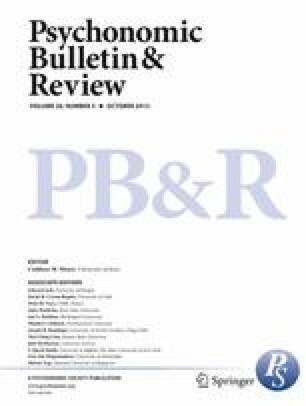 Experimentally controlled exposure of pictures of colored objects influenced people’s preferences for abstract patches of color, provided that the participants simultaneously evaluated their affect for those objects. In particular, exposure to liked/disliked red and green objects led to corresponding changes in preferences for red and green color patches, and the strength of these changes was correlated with the magnitude of differences in preferences for the corresponding objects (Exp. 1A). This interaction was absent when participants did not evaluate their object preferences during the exposure phase (Exp. 1B), suggesting that affective evaluation of the colored objects is crucial for object exposure to influence color preference in this paradigm. Experiment 2 replicated the interaction from Experiment 1A in immediate testing, but not after a 24-h delay. However, the degree to which an individual’s change in color preference lasted overnight reliably covaried with the strength of the change immediately following image exposure. In Experiment 3, a similar interaction was evident in color preference changes after forming mental images of affectively biased sets of colored objects. Thus, activating preexisting knowledge of perceptual and affective properties of liked/disliked objects, without sensory experience, is sufficient to change color preferences. How are these effects to be understood? One possibility is that viewing or imagining colored objects produces incremental strengthening of existing associations. This learning account is analogous to evaluative conditioning, which may be a form of classical (Pavlovian) conditioning in which the conditioned response is a preference judgment rather than an explicit behavior (De Houwer, Baeyens, & Field, 2005; De Houwer, Thomas, & Baeyens, 2001; Hofmann, De Houwer, Perugini, Baeyens, & Crombez, 2010). In the context of the present study, preferences for the noncolor attributes (such as positive/negative taste) of colored objects (unconditioned stimuli) would be transferred to the colors (conditioned stimuli) associated with those objects, to produce a change in color preference (conditioned response). Because our participants already knew both the object–color associations (e.g., ripe strawberries are red) and the corresponding affective judgments (e.g., “I love ripe strawberries”), it is implausible that the results were due to newly learned associations. Rather, color preferences may be updated after new experiences with previously known colored objects by strengthening of preexisting associations. However, this account suggests that such preference changes should be relatively durable, contrary to their 24-h extinction in Experiment 2, unless one also assumes that recent updates to evaluative associations decay over time. Another possibility is that experiences of viewing/imagining colored objects while considering their affective values activate (i.e., prime) this preexisting knowledge. Then, when asked to rate color preferences, people compute them “on the fly” by weighting the relevant information (e.g., object preferences) according to their current memory strength. In this case, no long-term effects would be expected, because the increased strength of the relevant knowledge in memory would presumably subside rapidly after its recent activation, consistent with the results of Experiment 2. The fact that comparable changes in color preferences were obtained following the mental imagery tasks in Experiment 3, which presumably activated people’s prior knowledge about object colors and valences, is also consistent with this priming account. Even if the present effects were due to priming, however, the initial learning of the associations might be due to some form of evaluative conditioning. Further investigation will be required to determine the mechanisms involved and the circumstances under which they operate. In any case, the present results establish a causal connection between people’s preferences for an abstract patch of color and their preferences for objects that are characteristically that color. This finding represents further support for the EVT, beyond prior correlational evidence (e.g., Palmer & Schloss, 2010; Schloss et al., 2011), but it leaves open several important questions about how preferences are shaped by experience. Among the most important is whether different objects are weighted differentially in determining one’s preference for a particular color. Potentially relevant factors include an object’s importance in one’s life, its perceptual salience, the frequency with which it is experienced, and the strength of the affective response that it causes. Substantial additional research will be necessary to understand the precise mechanisms that link people’s experiences of colored objects to their preferences for the corresponding colors. Taylor and Franklin (2012) found that the number of associated objects for each color explained as much variance in color preferences as WAVEs did, with more-preferred colors being associated with fewer objects. However, a subsequent study of individual differences showed that individuals’ color preferences were significantly related to object valences but not to the number of objects that people associated with the colors (Palmer, Schloss, & Hawthorne-Madell, 2013). All subsequent statistics are one tailed (unless otherwise specified), because the EVT predicts the direction of the relevant effects. The authors thank two anonymous reviewers and Rosa Poggesi, Thomas Langlois, Will Griscom, Mieke Leyssen, Sarah Linsen, Ania Jaroszewicz, Jessica Jimenez, Lily Lin, Chistopher Lau, Mathilde Heinemann, Madison Zeller, Arielle Younger, Meghna Dholakia, Jackson Jewett, Stephen Guo, Kelly Whiteford, Saki Wang, and Madeline McComb. The project was supported by National Science Foundation Grant Nos. 1059088 and 0745820 and by a Google Gift to S.E.P. Any opinions, findings, and conclusions or recommendations expressed in this material are those of the author(s) and do not necessarily reflect the views of the National Science Foundation.